Who takes the win and who unexpectedly shows up during the slippery showdown? 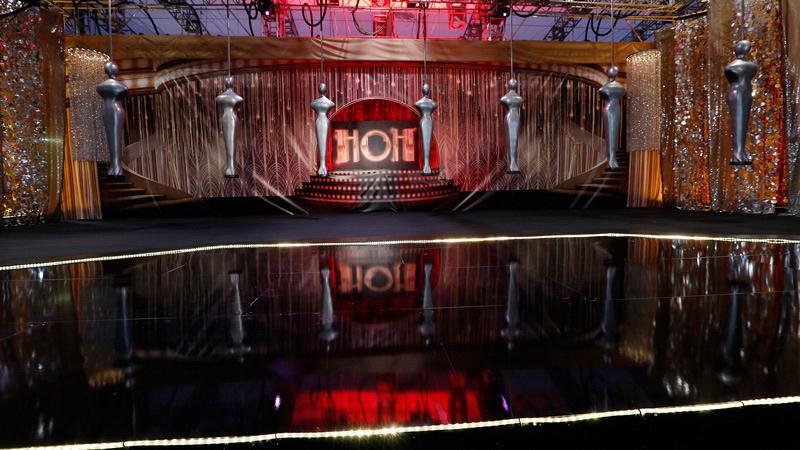 With all 11 Celebrity Big Brother Houseguests now living in the house, it was time for one of the most thrilling segments of premiere night—the first HOH competition of the season called "Award Squeezin'." After Omarosa lucked out with safety for the week, the rest of the house got right into the competition by wrapping their arms and legs tightly around oversized HOH awards and holding on for dear life. The pressure was on the women to tough it out to the end, knowing that their new girls alliance was down one with Omarosa sitting out the comp. "Ugh, now I have to hold on for all of the girls. I'm not letting go," said Shannon Elizabeth, looking around at her competition. After some time had passed, the focused celebs were treated to a totally unexpected visit from some familiar BB faces. "How’s everybody doing?" asked host Julie Chen. She added, "This award seems to be missing something, like a good 'ol song and dance number!" And just like that, out came two-time BB Houseguest Paul Abrahamian (Big Brother 18, Big Brother 19) dressed to the nines singing a jazzy tune! "The battle’s begun, the Head of Household is here, get ready for the fun, the sweat, and the tears," he sang. Rocker Mark McGrath was shocked. "I'm hanging on for dear life and I hear the voice of Paul. I'm in the presence of Big Brother greatness." Next up, fan-favorite BB13 winner Rachel Reilly arrived in a dazzling red dress and immediately who got a shout-out from one of her fans, Marissa Jaret Winokur. "I am a Broadway girl... I love a good opening number," she added, smiling ear to ear. As the celebs kept hanging on, more BB alums appeared in the backyard—like Jodi Rollins (Big Brother 14) and "Jody" (Big Brother 19). You just have to watch the full clip above for their hilarious reveals. There was one competitor (cough, Chuck Liddell, cough) who was more focused on the comp than any surprise backyard performance. "I don't know who these people are or what they're doing out there, but I've had enough of the singing already," he said. One by one, Houseguests slipped to the ground (along with their chances of being crowned HOH), until there were just two competitors remaining—James Maslow and Shannon. "It's starting to hurt in places I didn't know that it was going to hurt in this competition," said James. Shannon added, "I'm trying to keep all the girls safe... but I don't know how much longer I can hold on." Which other BB alum made a backyard appearance and who took the first HOH win of the season? Watch the full Celebrity Big Brother clip above to see how it all played out. Watch all-new episodes of Celebrity Big Brother on Wednesday, Thursday, Friday, and Sunday at 8/7c on CBS and CBS All Access. Then, be sure to check out the Big Brother Live Feeds—exclusively available through CBS All Access!—to eavesdrop on the Houseguests any time you want.